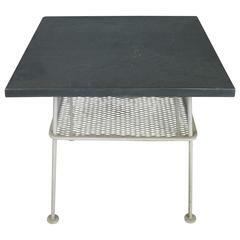 Large patio table by Russell Woodard in the rarely-seen slate iteration. 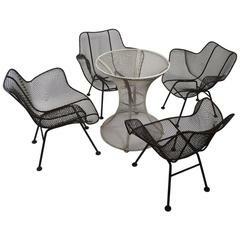 The Sculptura tables were made with real slate in the 1950s, but sometime in the 1960s or 1970s changed to a fiberglass slate. Slate top is 5/8" thick and rests on iron base. 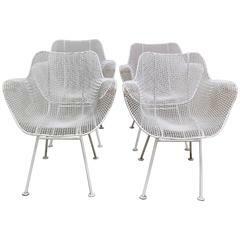 Please see our other listings for additional pieces by Russell Woodard including a set of four Sculptura armchairs. Minor delamination visible at edges as would be expected of vintage slate but extremely solid and sturdy. Structurally sound. Original slate has chipping and scratches throughout but still presents beautifully. 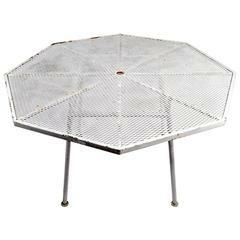 #C110 round table from the Granada Collection by Arthur Umanoff for Shaver Howard. Steel frame and scroll work finished in black. Four matching chairs available.